Spring is now upon us (despite the freezing cold winds and continuing snow threats…in March), and with it comes the start of our gorgeous new 2013 spring collection! To start things off, Pandora has created a beautiful arrangement of pieces based around, what is considered, the harbinger of spring, the Cherry blossom! The collection is made up of 14ct gold, white glass murano and silver pave. A signifier of the growth, development and uniqueness of each Pandora woman. 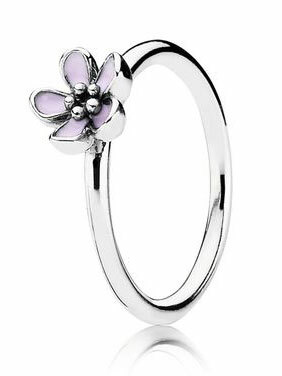 In addition to the charms they have also brought out a range of fabulous cherry blossom rings, earrings and pendants. Another collection is based around romance, where spring goes, romance is sure to follow. With delicate, freshwater cultured pearls reminding us of everlasting bonds and life-long love. Including tiaras, bouquets of flowers and a bride and groom charm which I’m sure will be extremely popular around wedding season. We were amazed at the amount of detail in this charm, very impressive! 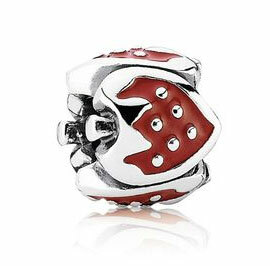 Here at Pandora, Bath our absolute favourite collection is fairy tale. This has been the most popular collection so far and you can see why. The collection includes castles, crowns, a frog with a 14ct gold crown, a fabulous fairy tale book and a beautiful two tone birdcage. 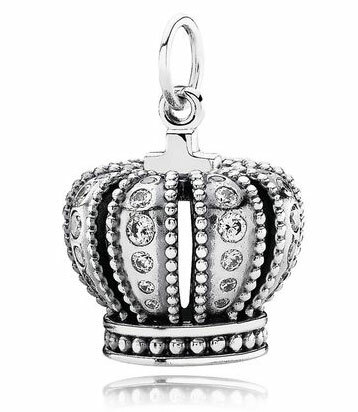 The bestselling crown charm is now available in a pendant within this collection which is set with 48 flush cubic zirconia’s, it is just fabulous! This collection also brings us more stacking rings which are always popular here at Pandora, they are a perfect way to update your stack or just as beautiful on their own. The My Garden collection features cherries, strawberries and a watering can to name but a few, symbolizing the growth of your garden and reminding you that all living things need love. Enamel also features heavily in this collection. To create the gorgeous enamel charms, the goldsmiths add the enamel paste by hand and then evenly distribute it with a toothpick before placing them in a kiln to set. That’s true attention to detail! Pandora have also created Local Charms collection, which features scissors and a comb charm, perfect for hairdressers! The UK local charm is the incredibly detailed Scottish Terrier charm which has been a big hit and finally a new elephant charm. 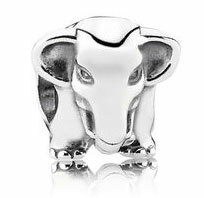 Interestingly this elephant has its trunk pointing downwards, said to signify luck in Asia and India. 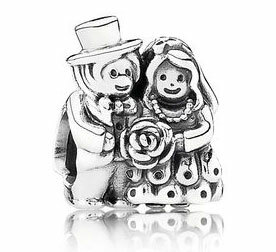 These new collections have been massively popular here at Pandora, Bath and we know there are more incredible charms to come! Watch this space – you won’t be disappointed. The beautiful Cloud9 collection from Chlobo has arrived here at fabulous and we’ve wasted no time trying on each piece and picking our favourites!! Whether you are new to Chlobo or already an avid collector, we know you are going to love these new season designs! Featuring Labradorite, Red Tigers Eye and Bamboo Coral stones combined with symbols of protection and love, this collection is stunning and perfect for jewellery lovers who love to stack and layer! Even more, for the first time, Chlobo has used Gold plating giving some of Chlobo’s most popular designs a new edge and beach-ready look. This new collection was inspired by Chloe’s trip to Lake Como last year where she attended a friends wedding. Each stone was chosen in reminder of the scenery and atmosphere of Lake Como from its glistening waters to the red sky at night. Labradorite is a healing stone known as the stone of spiritual wakening and is a lovely stone for the sunshine in a fresh grey tone. Red Tigers Eye is a stone believed to bring success and good fortune which glistens with faceted beads in bracelets teamed with symbols of protection and happiness. Bamboo Coral is said to bring wisdom and is one of the seven treasures in Buddhist scripture. In many of the pieces, this stone has been teamed with 24ct Gold Vermeil for a lovely summer’s accessory! The Mini Cute Bracelets already so popular in Sterling Silver (with fabulous & celebrities alike!) are now available in 24ct Gold Vermeil which will look fab stacked together! 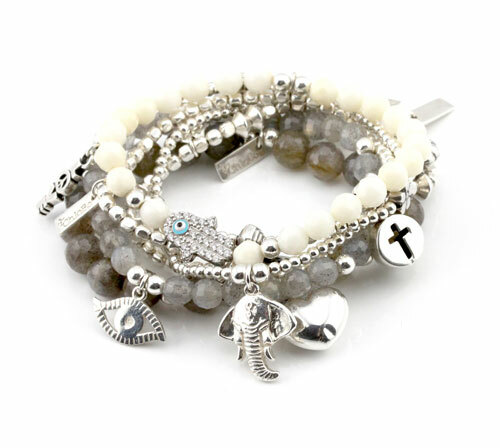 We particularly love the Cute Bracelet with a Dragonfly, a stylish good luck charm and a symbol of magic! Be the first to get this collection and shop online here with free delivery! We also offer free gift wrap too, perfect if you want to give a loved one a stylish Easter treat! Spring is here! Well, almost. The cold might be adamant on sticking around for a bit longer but that doesn’t mean we can’t brighten up our wardrobe with a new Spring Summer style, and with all our brand new collections how can we resist! We are really excited to share our latest spring collections from some of our favourite designers and even some brand new ones! Whilst admiring the new season trends hitting the catwalk of late, we have been eager to wear our sunnies and rush into our favourite stores to buy this season’s must have skirts, maxi’s and fedoras in anticipation of the sunshine, and frankly we can’t wait to get out of our winter boots and stick on some sandals! But whilst we patiently wait for the weather to turn around, accessorise we can do! It’s always the right time to add a splash of colour or texture with a statement piece of designer jewellery! To make it easier to see what’s on-trend this season in fashion as well as jewellery, we have highlighted the four key trends here & on our website where you can shop your favourite pieces spotted in our new spring catalogue and many more fab new designs! We also have some great interviews in our Designer Lounge from many of our designers including the inspiration behind Joanna Dahdah’s Muse collection for Jersey Pearl, as well as a look through Christina Lihn’s sketchbook that inspired her romantic collection of Blossom jewellery! What’s more, we have a gift guide for all occasions to help you find the perfect pressie for your loved ones as well as free delivery and gift wrap on all UK orders, so there has never been a better time to shop online with fabulous! There really is a Gold Rush this season, as many of our favourite designers add the warmth of Gold into their collections. We have fallen in love with the new Thomas Sabo collection which has used Yellow and Rose Gold in their Sterling Silver collection for the first time. Some of their iconic designs have been given a glamorous make over with gold plating and the popular Special Addition collection has combined these gold shades with vivid Turquoise for a beautiful combination. Brand new to fabulous, Nikki Lissoni has us all excited here with their interchangeable coins that make changing the look of your necklace so easy and stylish! This collection is fun and extremely versatile with a collection of small and large coins and different chain lengths, all available in Rose Gold, Yellow Gold and Silver. Lots of the fab girls are mixing their Silver chains with Rose Gold coins for a trendy combination! Even more, if you are a TOWIE fan, Lauren Pope is the face of this designer and she is visiting our Bath store very soon! (Check out our events page for details!) Once you have started your Nikki Lissoni collection, you can easily choose your next addition online where you can view the collection altogether (or save it to your wishlist for someone else to treat you!) Although as the fab team has discovered, it does take some time to decide which one is your favourite!! Jersey Pearl is another new designer to fabulous that we are delighted to introduce. This classic and elegant collection has captured the 1920’s era and has helped us rediscover our love for Pearls! Pastel shades and feminine looks are a massive trend this season and Lola Rose has captured this perfectly with their latest pieces. We think the highlight of the new Lola Rose collection are the colours of Pastel Blue and Capri Green which are the ideal shades to compliment a new season wardrobe. Be bold and don’t be afraid of colour! We have some fantastically bright new additions that are the ideal accessory to the sunshine! From bright bracelets in Nomination’s You Cool collection and the designs of charity supporters Chavin and Good Works, as well as fun statement watches from Ice and Swatch, there are lots to choose from. If bright clothing is not really your thing, then accessories are the perfect way to add a splash of colour to your outfit without being too overpowering. With more brilliant watch collections at fabulous from designers such as Ted Baker and Storm, we can now mix our Rose Gold pendants and Turquoise charms with a complimentary statement watch. The combination of Tortoiseshell and Rose Gold in the new line of Kenneth Cole are ideal! 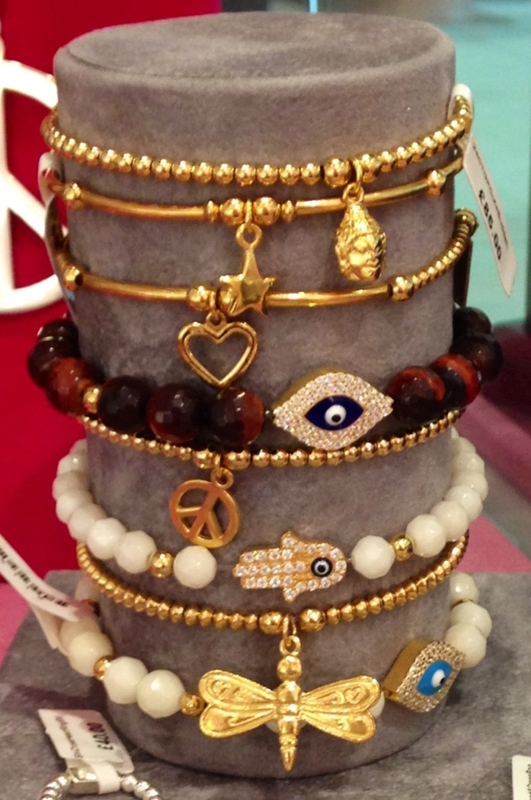 For the boho look, stack layers of necklaces and bracelets with iconic symbols such as the Hamsa Hand or Buddha! We have even more fab collections on their way so keep a look out!! Shop the fab5 gift guide for this Mother’s Day. Order online for free UK delivery and free gift wrap, or choose next day delivery for £5.